Attorney General nominee Sen. Jeff Sessions, R-Ala., is shown while meeting with Sen. Charles Grassley, R-Iowa, Chairman of the Senate Judiciary Committee, on Capitol Hill in Washington. Several NAACP members, led by their national president, staged a sit-in Tuesday, Jan. 3, 2017, at the Alabama office of U.S. Sen. Jeff Sessions to protest his nomination to be the nation's next attorney general. MONTGOMERY, ALABAMA (AP) — The national president of the NAACP and five others were arrested after staging a sit-in Tuesday at the Alabama office of Sen. Jeff Sessions, the nominee for U.S. attorney general, the civil rights group said. The organization held the demonstration to protest Sessions' nomination by President-elect Donald Trump, criticizing Sessions' record and views on civil rights, immigration, criminal justice reform, and voting rights enforcement. "We have an attorney general nominee who does not acknowledge the reality of voter suppression while mouthing faith in the myth of voter fraud," NAACP President Cornell William Brooks said by phone earlier in Tuesday's protest. Brooks called Sessions a poor choice to lead the U.S. Justice Department. The sit-in at Sessions' office in Mobile, Alabama — the city the Republican senator calls home — began around 11 a.m. Tuesday. Demonstrators refused a request by the manager of the building— which includes several other tenants in addition to Sessions— to leave when the building closed for the day at 6 p.m. Police could be seen on video footage coming and handcuffing the six protesters and escorted them to a police van. "We all are aware of the laws of trespass. We are engaging in a voluntary act of civil disobedience," Brooks told the officers who arrived at the scene. The NAACP broadcast the events live on the organization's Facebook page. WKRG of Mobile reported that the six, which included Brooks and the president of the Alabama NAACP, were charged with misdemeanor criminal trespass and released on bond. The all-day protest ended in handcuffs but without confrontation. Brooks shook the hands of the officers and the officers allowed the protesters to kneel and pray before they were led away. Brooks criticized Sessions' prosecution of African-American voting rights activists on voter fraud charges when he was a U.S. attorney in Alabama. The group also raised concerns about immigration policies under Trump, the future of the Voting Rights Act and noted allegations — raised decades ago in Sessions unsuccessful 1986 confirmation hearing for a federal judgeship — that Sessions made racially insensitive remarks when he was a U.S. attorney. "Many African-American leaders who've known him for decades attest to this and have welcomed his nomination to be the next Attorney General. 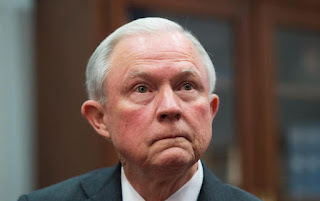 These false portrayals of Senator Sessions will fail as tired, recycled, hyperbolic charges that have been thoroughly rebuked and discredited," the statement added. Sessions was in Washington D.C. and not in his Mobile office at the time of the protests. In testimony at the 1986 confirmation hearing, Sessions was accused by some hearing witnesses of saying the NAACP was "un-American" and saying he thought Ku Klux Klan members were "OK until I found out they smoke pot,"
Sessions said during the hearing that the Klan remark was a joke and that other remarks were mischaracterized. What he had said, Sessions said, was that civil rights groups hurt themselves when "they take positions that people think are un-American they hurt themselves." He then praised the work of the NAACP. The demonstration marked the latest criticism of Trump's pick for attorney general. Sessions' confirmation hearings are expected to begin next week, highlighted by a vigorous push both by those favoring the nomination and those opposed to it. Former Democratic Massachusetts Gov. Deval Patrick, who was part of the NAACP Legal Defense Fund team representing the black civil rights activists in the voter fraud prosecution, on Tuesday urged U.S. senators to reject Sessions' nomination.